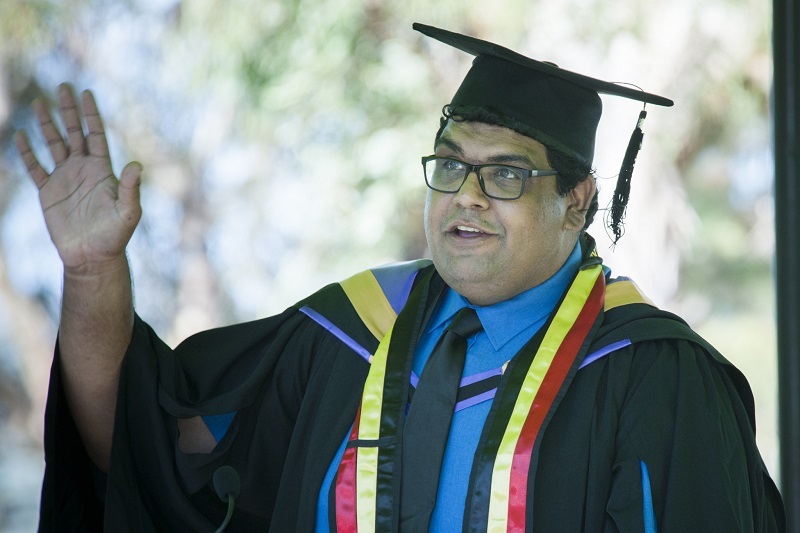 It was a special moment for the Kirk mob when Michael Kirk became the first member of his family to graduate from university, at the University of New England Autumn Graduation ceremonies. “It was a big deal and a very proud day for me,” said Michael, a Kamilaroi man who grew up in Glen Innes. But perhaps not as memorable as his final practical last year at Moree Public, in the north-western NSW town in which he was born. Other members of Michael’s family have now enrolled in university studies, and while the humble graduate is reluctant to take credit for that, he hopes his pathway demonstrates what’s possible. Michael had been working as a casual tutor for Aboriginal students at Glen Innes High School for two years when he completed the TRACKS tertiary preparation program offered by UNE’s Aboriginal Centre Oorala. He enrolled in the Bachelor of Education (K-12 teaching) course a year later. “The first year was really, really hard and I failed quite a few units, but I hit back in my second year and passed every unit after that,” Michael said. “It was a case of finding my feet, and the style of study and organisation that suited me. It’s been an up-and-down ride, but I knew from first-hand experience the positive difference that teachers could make. Oorala director Greg Davison said Michael has been a conduit for the success of other Indigenous students. “All of us at Oorala are thrilled at Michael’s success and know that he will make an enormous contribution to our communities,” Greg said. Michael is grateful to Max Schroder for his scholarship and help, and to ITAS tutor Andrea Watson for her personal and academic support throughout his studies at UNE.